#1. Facebook with my writing coach and hero. Somebody needs to tell me why I should give a rat's hinder about football. Lynn S. Crawford Because you like to see grown men who make more money than teachers, firefighters and police combined bashing each other in the head in expensive uniforms and equipment that changes weekly so the uniform companies can make as much money as the sponsors of these asinine grunt sessions. Got it?
" We need to say grace. Where are the kids?" Someone answers: "Watching the game." Host: " It doesn't matter. Thanking God for our blessings is the only game that matters." "Think about that poor U of A quarterback. His last college game and he blows it in the last few minutes of the 4th quarter. He will carry that with him for the rest of his life." "Think of our great-nephew. His first week in Afghanistan and he is shot and has to kill his shooter. He will carry that with him for the rest of his life." "Okay, I get your point." #4. Me talking to myself. Me. " I can't stand it. Joe is watching USC vs Notre Dame. My mom told me not to hate anything or anyone. I strongly dislike both these teams." 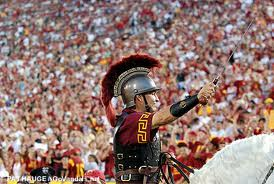 Me: "Try being at the U of A in the 50s in the Western Athletic Conference and having the arrogant, self centered Trojans coming to your so-so stadium and lording it over you. Arggghhh!" Me: " Try living in a town where grown men have the Notre Dame fight song as their car horn and/or doorbell sound. 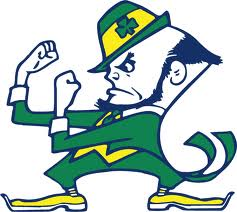 Try living with the ND wannabees who wear the gear and prance around like the ditsy, self important leprechaun. Gives me the heeby geebies." So, knowing that Joe is rooting for Notre Dame, I decide to go along - but only because of Uncle Dave and Uncle Vince. (You'd need to know them to understand.) At least Uncle Vince might sneak me into heaven for my one night love of the Fighting Irish. Uncle Dave will just hoist a brew to thank me. Having made that decision - I have also decided to retire to the living room and continue reading my book. I can find out the score later. I don't really have to watch it. Next week I can go back to rooting against both of them. Life is too short. Prioritize.